The Savings Component of your plan enrolls you in a tax-deferred investment account so you can enhance your savings for retirement. The contributions you and your employer make to your investment account are invested in the State of Michigan 401(k) and 457 Plans. It is important that you stay on top of your accounts and take advantage of the resources available to you. Semi-annual statements are mailed about two weeks following the months of June and December each year. It is very important for you to review your statement each time you get it. These statements summarize your transactions, account balance, and investment performance. The statements also list your contribution rates and beneficiary elections. You may choose to receive your statements electronically. You can access your account information online at any time. Click on Investment Account Login and enter your Username and Password. The password you’ll need to log in to your account was mailed to you once you were enrolled in the plans. If you forgot your password, you can click on Forgot your password? on the login page. You can also call the Plan Information Line. When you have questions about your account, you can call the Plan Information Line at 1-800-748-6128. 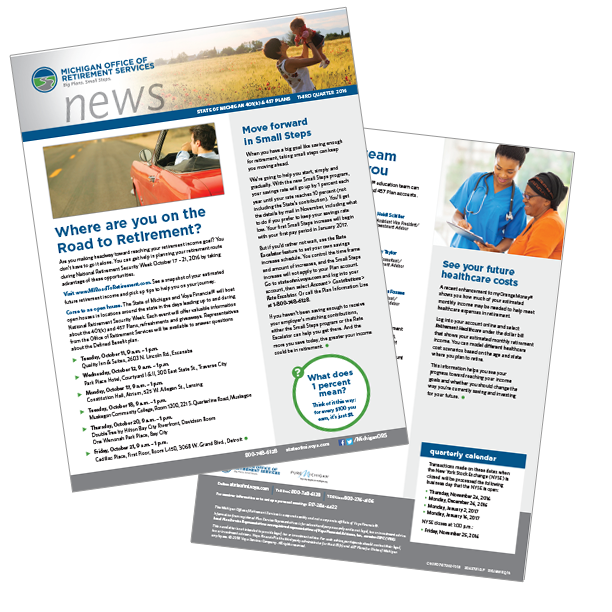 You will receive the Pension Plus News along with your account statement that includes important plan information, updates about any changes in the plans, or the effect of new laws on the plans. Newsletters are also available online. You can also choose to receive electronic communications.